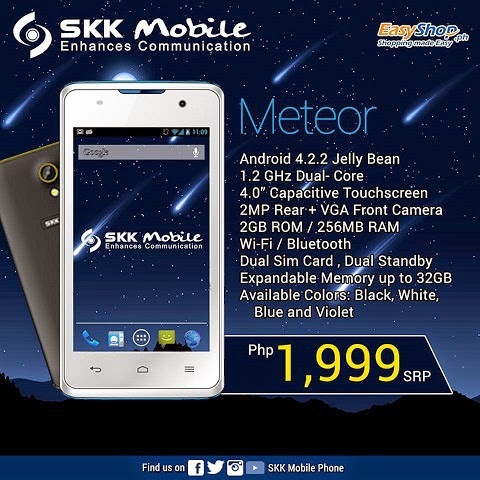 SKK releases the Meteor phone under the Php 2K pricetag. The handset boasts a dual-SIM capability and 1.2-gigahertz dual-core processor in its gut. The local company is one of the few outfits to brew an Android Jelly Bean phone in this price tag. Of course, there are some trade-offs. The Meteor is only 2G-capable and only packs a minute 256MB of RAM. However, for those willing to have a basic phone with nifty processor, this device might be up for your budget. You can choose between Black, White, Blue and Violet hues.